I’m going to use this first dispatch for our summit day to try and describe to you what it is like here at Base Camp as our summit day begins. Just past 10:00PM Tashi, our Lama, was out at the Chorten, lighting the sacred juniper fire to bless the climbers who are waking up at the South Col. Soon after, I went into the Communication tent and found what was already a cozy scene. 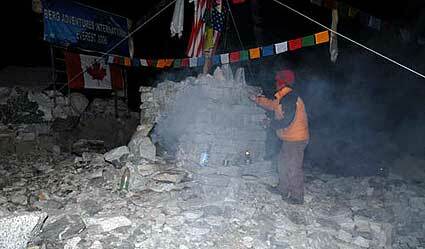 The Sherpas here at Base are on what they cheerfully call “night duty” as we wait for news from above. Sherpas never seem to have a problem passing the time in such situations; the cards always come out. 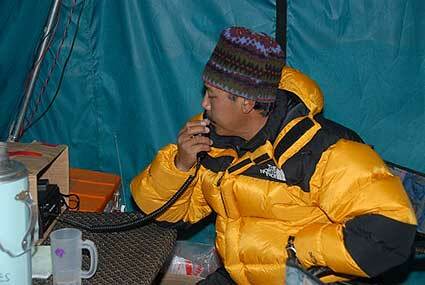 A ng Temba was trying to reach (call) the South Col from just past 11:00PM. Finally at 11:30PM we learned that our advance team of Sherpa climbers had left the South Col, Danuru, Pasang Tenzing, Pemba Dorjee and Dawa Tsering have begun to climb. AT 12:10AM I talked to Dave Hahn. He reports that all the climbers are doing well with their pre climb preparations. Drinking, eating, toilet duties being the big three to get the day started well. Dave told me that he estimated the wind speed at the South Col to be 10  12 MPH. The sky is perfectly clear over Everest.